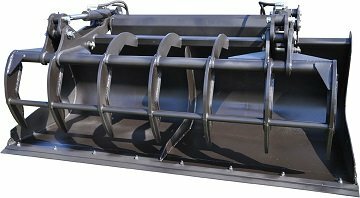 Tipper available from 1,70m to 2,60m, it has a flat bottom with a central inner reinforcement for intensive work. GRL.S2E: Welded flat teeth cut welded ep. 20mm with 2 blanks connecting the teeth between them. Possibility of teeth flush or overflowing.